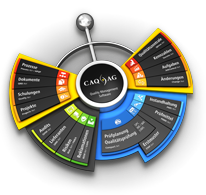 Your personal login to the website of CAQ AG provides access to a variety of online-services. As CAQ AG customer you can, for instance, download the most recent software release, documentation, or updates. You can, furthermore, configure your e-mail newsletter settings, request information material, or view the SUI-Portal and post your own entries. Mit Absendung Ihrer Registrierung stimmen Sie der Speicherung Ihrer Daten, der Datenschutzerklärung und den AGBs zu.